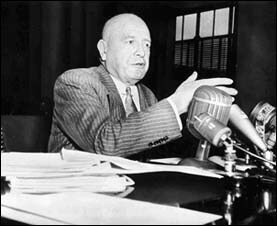 In 1930, in recognition of his headline-worthy service to the Bureau of Prohibition (and as a result of a string of suspcious scandals in the department) Henry Jacob Anslinger was made Commissioner of the newly-formed Federal Bureau of Narcotics, with a brief to enforce the Harrison Act (which had regulated cocaine and opiate usage, largely as a quality control measure aimed at quack doctors and snake-oil peddlars). Alcohol Prohibition was already failing by that time, and the Harrison Act really didn’t generate a whole lot of newsworthy arrests, because people didn’t break it all that much. Harry Anslinger was a very ambitious man, and saw himself as a rival to the legendary J. Edgar Hoover of the FBI. For that to happen, Anslinger would need an adversary as headline-grabbing as the Mob, and the FBN simply didn’t have one. So Harry Anslinger went out and made himself one. In the 1920s and 1930s almost no-one was getting high on cannabis in the US except Mexicans , a few Filipinos, and New York intellectuals who’d read some Jung. The American Medical Association used cannabis in a number of medical remedies, which according to the 1937 evidence of the AMA’s Doctor Woodward totalled about a third of those on the register: bear in mind that to this day, cannabis carries a Schedule 1 prohibtion, which defines it as ‘without recognised medical use’. Why did Anslinger pick such an obscure target? Well, he knew a guy who really, really didn’t like Mexicans.